In a bowl, combine the cake mix, eggs, butter and oil. Mix well. On a baking sheet lined with parchment paper, scoop cookies onto pan. Using a melon baller works well. Bake for approximately 10 minutes. Let cool on the pan for 2 minutes before transferring to a cooling rack. Let cool completely before frosting. In a medium bowl, mix the confectioners’ sugar and cream cheese together until it’s well incorporated. Pipe a small amount of icing on top of the cookie, or you can also use a knife if you prefer to smooth the icing onto the cookie. 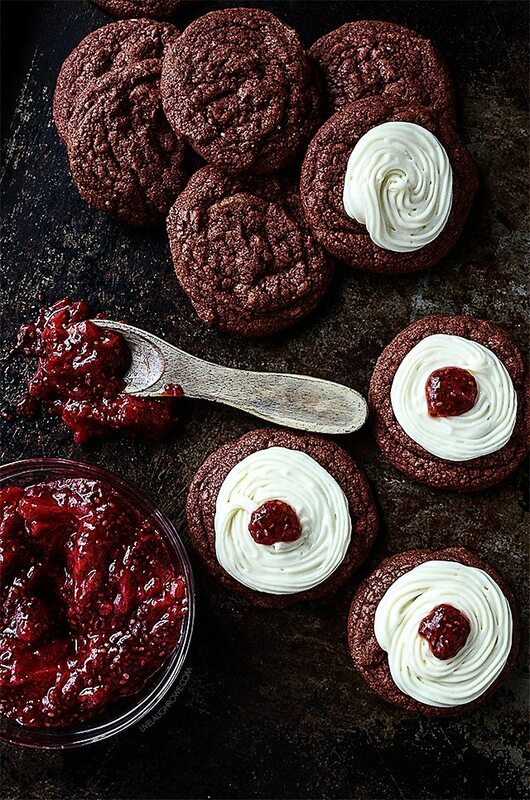 After icing all cookies, place small dollops of raspberry jam in the center of the cookies.